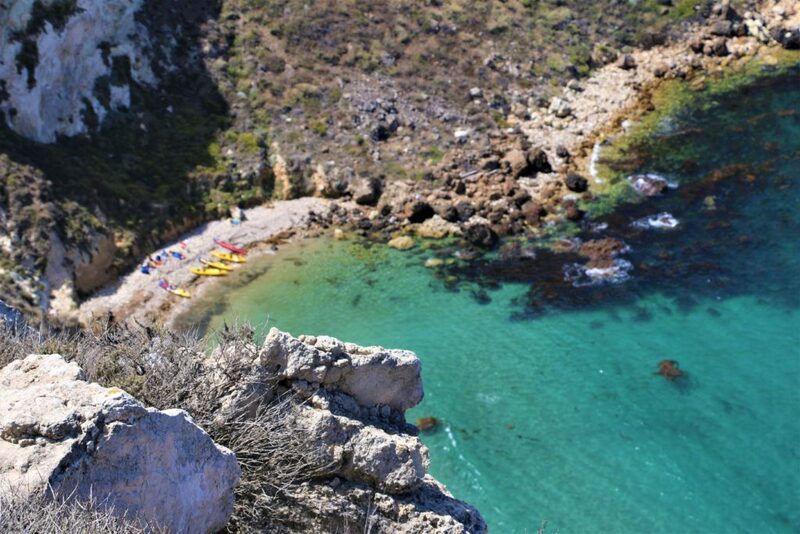 Did I ever want to visit Channel Islands National Park? To be completely honest, the first time I heard this name, I would probably say ‘no’. I didn’t know anything about the Channel Islands or what to do there. The simple idea of going somewhere on a boat didn’t seem to be appealing to me. However, the more I heard about the Channel Islands the more I became curious. One day to pacify my curiosity, I turned to Google for the answers. While reading all available information on Channel Islands National Park, slowly but surely my curiosity turned into obsession. Without any further delay and too much planning and preparation, we decided to go to the Channel Islands the following morning. 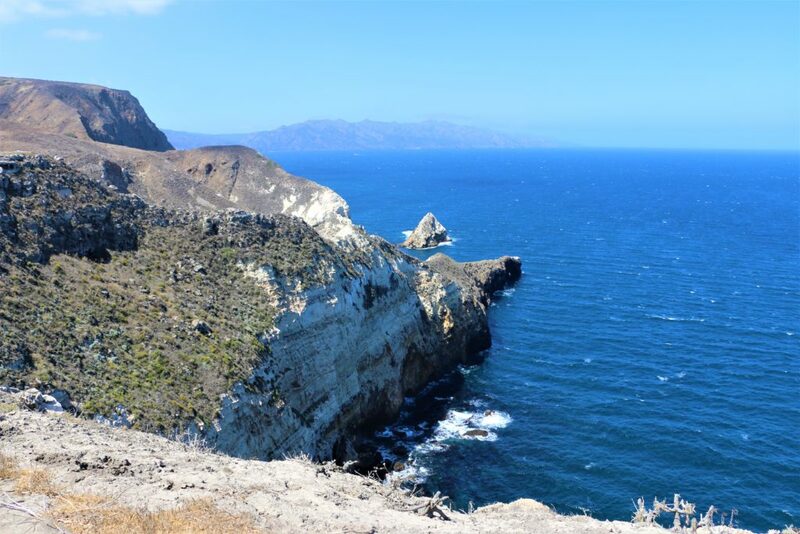 Channel Islands National Park consists of five astounding islands (San Miguel, Santa Rosa, Santa Cruz, Anacapa, and Santa Barbara) and their ocean surrounding. The islands have a very long history. 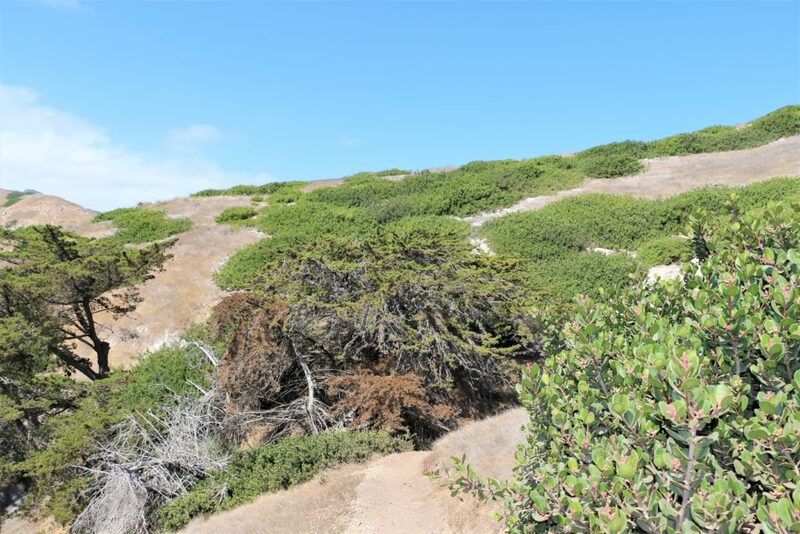 More than 13,000 years ago, they were occupied by Chumash and Tongva Native Americans who eventually were superseded by Spanish immigrants and used mainly for fishing and agriculture. The Channel Islands with their unique fauna and flora are also known as one of the richest marine ecosystems in the world and attract more than 70,000 people a year. 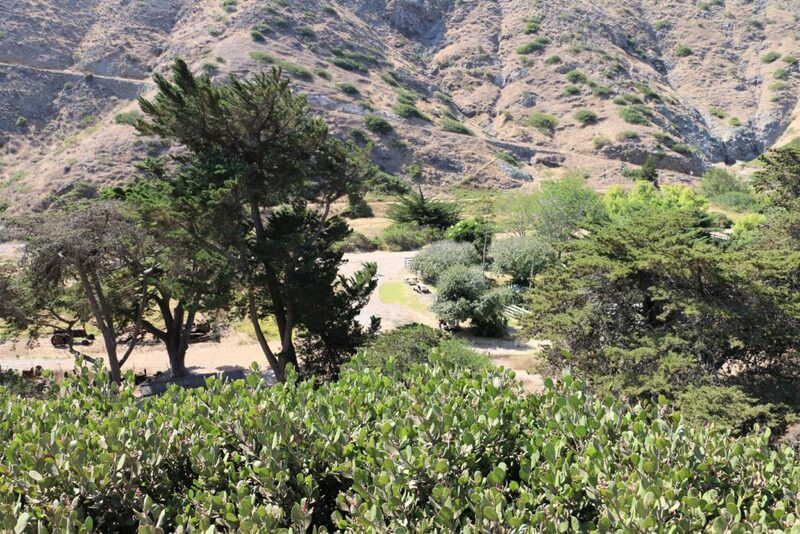 Most of the tourists visit Channel Islands National Park during warmer summer months. The islands provide a nice get-away from busy everyday life and are perfect to spend some quality time with family and friends. Some of the activities to do on the islands include but not limited to hiking, camping, kayaking, snorkeling, surfing, fishing, whale and bird watching. The best way to travel to the islands is via public boat or air transportation. 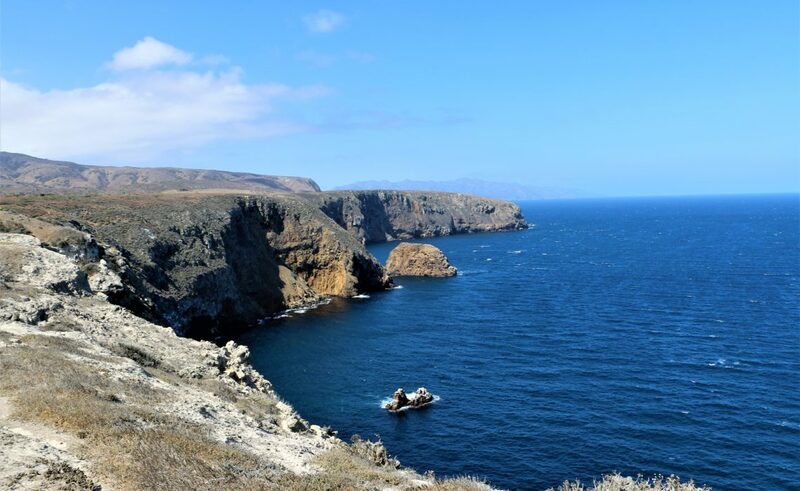 Among five islands our choice fell on Anacapa Island, which is a perfect place for a one-day or short overnight camping trip. Our journey started in Ventura where we took park concessionaire boat and were on the way to our destination. 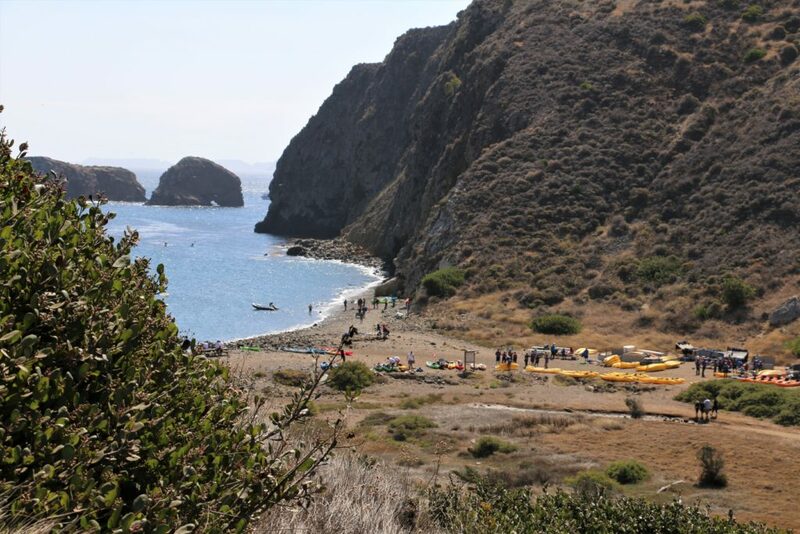 It took us about one hour to reach the shore of Anacapa Island. 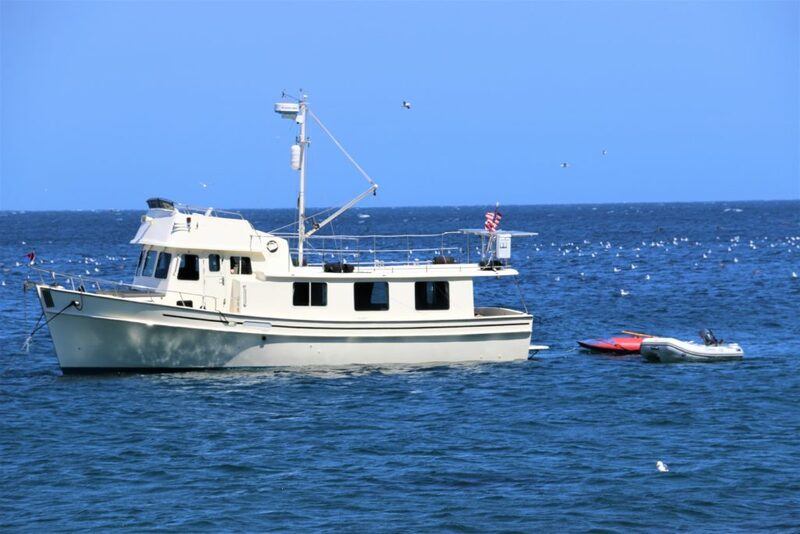 During the ride you might be lucky to see sea lions or other marine animals. To my dismay and big surprise, I ended up being seasick halfway throughout the trip and couldn’t wait to finally step on the solid ground. I noticed quite a good amount of people were also the victims of sea sickness. Seeing the island far in front of us, I breathed a great sigh of relief. An hour of excruciating travel was finally coming to an end. Once ashore, you are on your own. There are no goods, accommodations, food, or water available on the island. The visitors must plan ahead of time and bring their own food, water and anything else they might need. After catching our breath followed by the boat ride (I was the person who needed it the most) at the visitor center, we were ready for our big hiking day. 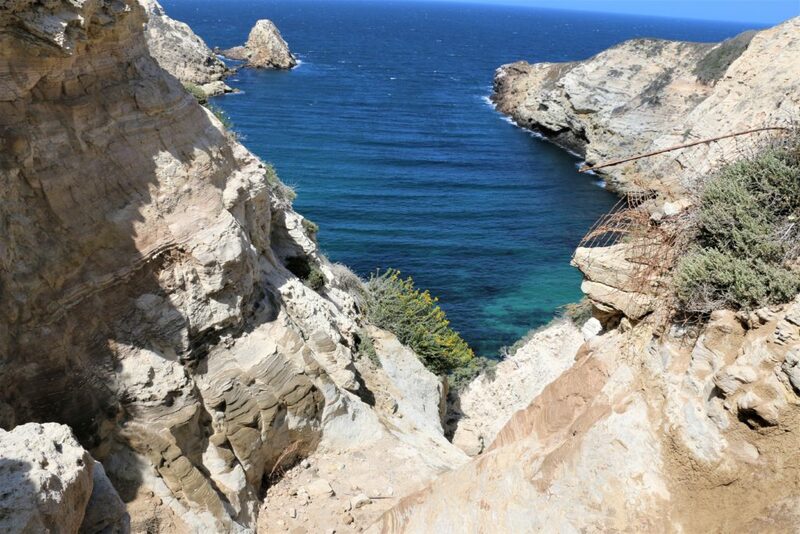 Except for climbing 157 stairs to the top of the islands, the hiking trails were relatively flat and easy while opening magnificent scenery and incredible coastal views. What a simple, yet enjoyable hike that was! At some point during our journey, we strayed off the designated hiking trail, went down the cliff and got as close as we could to one of the sea caves. This was the first time we regretted that we didn’t kayak and couldn’t go even closer to and explore the cave. But there was no need to beat ourselves up over this since we had a really good time and enjoyed our hike the way it was. On our way back to the visitor center, we decided to have a little picnic and replenish our energy with some food that we had brought to the island. My husband and I only had one problem there. It was extremely hard to find shade when there were no trees around. Nevertheless, we easily handled the heat once more. Finding the perfect spot for our picnic-lunch, we finally could have some rest, and enjoy our meal. Surprisingly, food always tastes better when you eat it outside especially in the nature. Probably the nature itself is that magical element that brings out all the flavors out of even simple meals. No matter how much we wanted to stay there longer and enjoy the scenery, warm weather and even that crazy wind, we had to go back to the shore in order to catch our boat, which was scheduled for the departure later in the afternoon. Back at the shore in dreadful anticipation of our ride back to the mainland, I finished all pistachios that were left from our lunch in order to at least somehow reward myself beforehand for unnecessary suffering of sea sickness. And surely, I had sea sickness once again… Placing my head on a table in front of me and patiently waiting for all the passengers to get back on the boat, which took more than an hour, was not something that I had anticipated earlier that morning before our journey. Once again I couldn’t wait to step out of the boat and get over that agonizing motion sickness. After all the passengers successfully made on the boat, it took us another hour to finally reach Ventura harbor. Oh what a day it was: full of ups and downs, excitement and disappointment! Sitting in our car and getting ready to drive back to Los Angeles, I already felt so much better and almost forgot about that bad sea sickness. The whole trip was such an incredible experience. 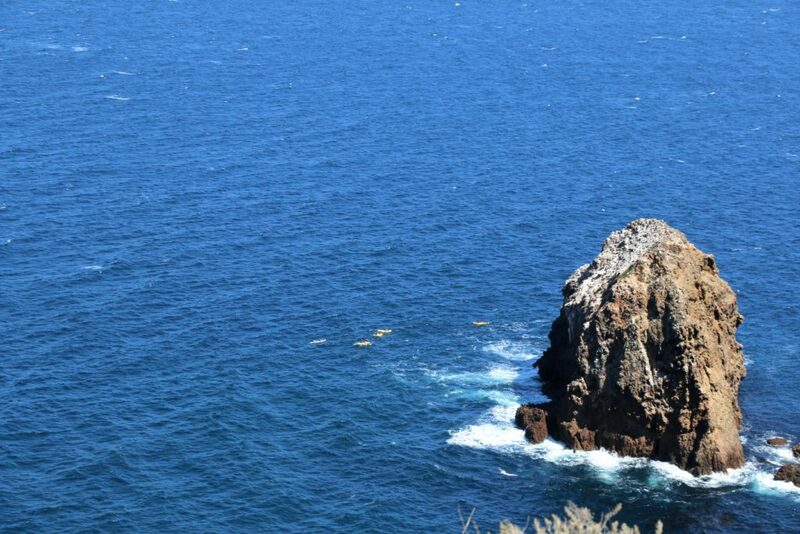 Do I want to go back to Channel Islands National Park and explore other islands? The answer is ‘definitely yes’! Such a beautiful islands.Thanks for share.